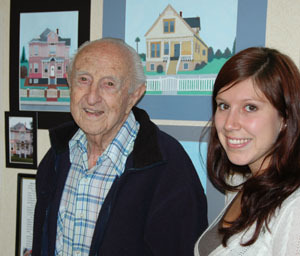 Sunshine Villa resident Howard Folger, who began painting last year at the age of 100, sold several works during a benefit art sale organized by Talia Gonzalez. All proceeds went to Second Harvest Food Bank. Psychology major Talia Gonzalez has always loved art, so she was quick to notice that residents of the Sunshine Villa Assisted Living community really enjoyed their weekly painting classes. This fall, Gonzalez capitalized on their enthusiasm, organized a sale of their paintings, and raised $550 for Second Harvest Food Bank. That's enough to provide 2,750 meals to hungry residents of Santa Cruz County. "Part of my goal was to give the residents an opportunity to give back to the community," said Gonzalez, a fourth-year student who volunteers at Sunshine Villa as part of the psychology major's field-study requirement. "One of the residents used to volunteer, and I know she wishes she could do more of the community-based things she used to do. I wanted them to have a chance to make a contribution." The success of the fundraiser exceeded Gonzalez's wildest expectations, and gave a boost to the artists, who sold more than 30 paintings. "They really liked it," said Gonzalez. "They were really proud to see their art displayed, and they were pretty thrilled to see their names on paintings with 'sold' tags." Each week up to a dozen budding Van Goghs gather together, raise their brushes, and create works in acrylic, watercolor, and tempera paints. Although at least one resident had some formal art training, others discovered their talent late in life. Howard Folger began painting last year--at the age of 100. "They really enjoy art, and I enjoy watching them," said Gonzalez. "There's a lot of talent there." Paintings by more than a dozen residents were matted and displayed in Sunshine Villa's lobby for a week before the November 8 sale. After the sale, Darcy Yaley, Sunshine Villa's activity director, promptly made out a check for $550 to Second Harvest. "It was a lot of fun," said Yaley. "I had a great time, and the residents loved it. And the people who were fortunate enough to get the artwork really loved it."